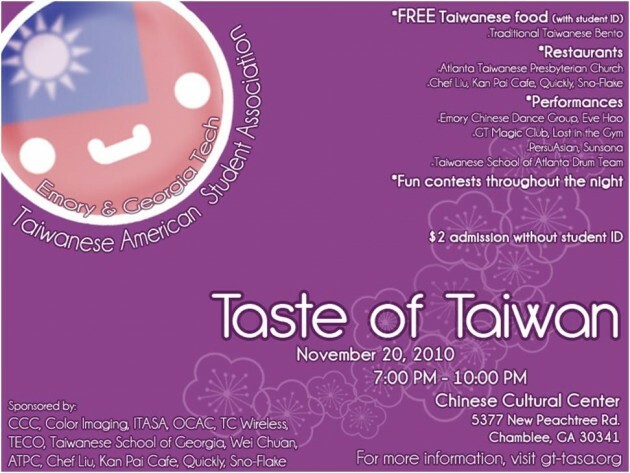 Emory University and Georgia Tech University TASA are hosting their annual Taste of Taiwan on November 20, 2010 starting at 7pm-9pm at the Chinese Cultural Center. Come enjoy a night of traditional performances, delicious Taiwanese bentos, fun activities, and restaurant samples! Bring your friends! Free admission (includes bento) for all college students with valid student IDs, $2 admission for non-college students. Bring cash to buy food coupons for restaurant samples. For more information visit the facebook event!